Here I am months later, writing two or three posts a week, reaching that milestone of 100 posts. This is a journey of discovery and my excitement continues. Thanks for stopping by and let’s continue our journey together. I searched for the right quote to capture my thoughts for this post. Nothing I read felt right. Yet I know to stay aware and observe. My youngest child is a senior in High School and last night was it – my last back-to-school night to meet his teachers. In one class I noticed the teacher posted quotes all over the room. I recognized most of the quotes, but I kept reading looking for the right one, a quote for this post that captures my feeling perfectly. It is either a brave or crazy act to start a blog, especially one that shares so much of self. To speak on leadership and related topics, I need to share who I am and what I find important. A friend told me after I wrote several posts that I needed to go deeper. If you are going to write a blog on leadership and essentially personal effectiveness, you need to share more of who you are and what is deep down important to you. Close the distance. This is not a game you play from the bleachers. You are in the game or not. Indeed I am following this advice. Yet I will never meet most of the folks who read this blog. How is that closing the distance? For those of you who write your own blogs, you know the answer. It is not a physical thing at all. We draw closer to each other by sharing ourselves through our writing and chosen media. We like, comment and build community. We indeed draw closer as we share and discover we have much in common. We learn from each other. I go to work each day knowing that my staff and coworkers read my blog. The feedback and discussions started from something I write is great. The distance between us lessens just a bit and we are better for it. I could not resist. Bo bold everyone. 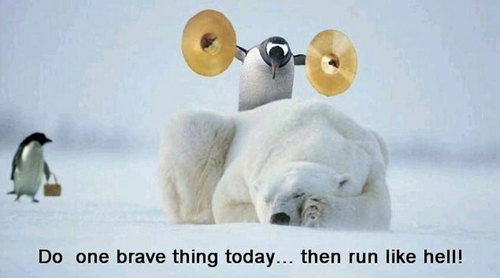 Be brave today.